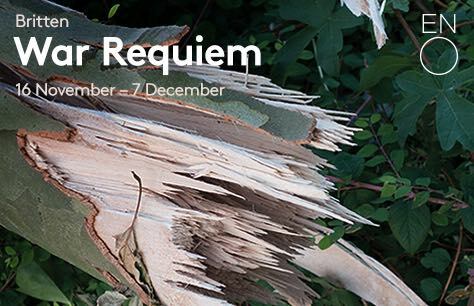 War Requiem tickets are now available for the new ENO season! Created to commemorate the centenary of the end of the First World War Benjamin Britten mixes the Wilfred Owen’s anti-war poetry with the timeless ritual of the Latin Requiem Mass. The result is an extremely evocative and heartfelt plea against man’s inhumanity to man. When communities, families, generations, countries and indeed the entire world are divided by war can they ever again make peace with themselves? Turner Prize winner Wolfgang Tillmans makes his ENO debut as designer. ENO Music Director Martyn Brabbins conducts this new production which is performed by an 80-strong chorus, a 40-strong children’s choir from Finchley Children’s Music Group, the complete ENO orchestra, a chamber orchestra and three soloists. War Requiem tickets are now available. Don't miss this incredibly moving production or the rest of the ENO season.